"Shame on us. Thousands of years and we cannot yet make a world." This line comes near the end of Lillian Hellman's Watch on the Rhine, now playing on the Guthrie's proscenium stage, and is one of the most devastating moments in this gorgeous play. Written in 1941, it's part war story, part multi-generational family dramedy, part romance, and part social commentary that still rings true 75 years later. It eerily shows us how history repeats itself, and how frustrating that is. Frustrating that Europe hadn't even recovered from what was then called The Great War before it embarked on another one. Frustrating that after witnessing the horrors of the Holocaust we allow genocide to continue to happen all around the world. Frustrating that we've seen the evils of fascism but it still exists. When will we learn? I'm sorry if this sounds hugely depressing, and this show is that to a certain extent. But it's also hopeful in its focus on a family that bands together, despite their differences, to stand up for what's right. So that maybe one day we will get it right, we will figure out how to make a world where all children eat a good breakfast every day, where no one is persecuted for their religion or gender identity, where women don't have to fear for their safety walking down the street or going to work. Watch on the Rhine shows us, while keeping us enthralled with its gripping storytelling, that we all have to keep watch. Despite being written over 75 years ago, Watch on the Rhine doesn't feel dated, other than by the gorgeous period clothing. 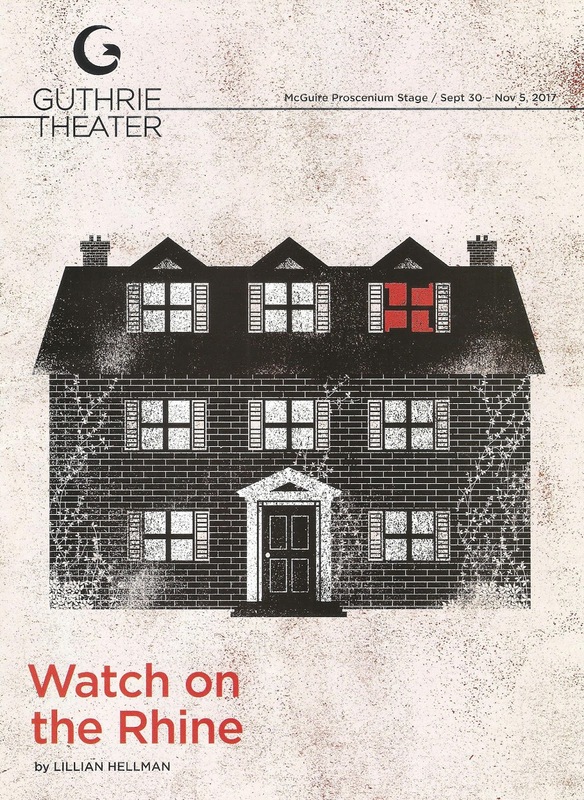 It feels like a smart, witty, relevant play. The Farrellys are a wealthy family living just outside of DC in 1940: father Joshua deceased but not forgotten, mother Fanny running her house (and her children) like a tight ship, son David a bachelor lawyer, and daughter Sara returning to the family home after 20 years living in Europe with her German husband Kurt and their three children. But it turns out Sara and Kurt are not just there for a friendly visit, they're fleeing Europe where Kurt has been working in the anti-fascist movement. Complicating matters are a couple of houseguests - family friend Marthe and her Romanian count husband Teck, who has a different opinion of what's going on in Europe. He may not be a Nazi, but he's at least a sympathizer, or simply an opportunist. He's like Max in The Sound of Music (that other great theater piece about Nazis), "what's going to happen is going to happen, just make sure it doesn't happen to you." Which is perhaps the most dangerous attitude of all, as Teck poses a danger to the family's temporary safety and security. But it's not just all war drama, there's also the family drama of a woman meeting her grandchildren for the first time, a brother and sister reuniting, a woman unhappy in her arranged marriage who finds solace elsewhere, a loving couple sacrificing their own happiness for the greater good. 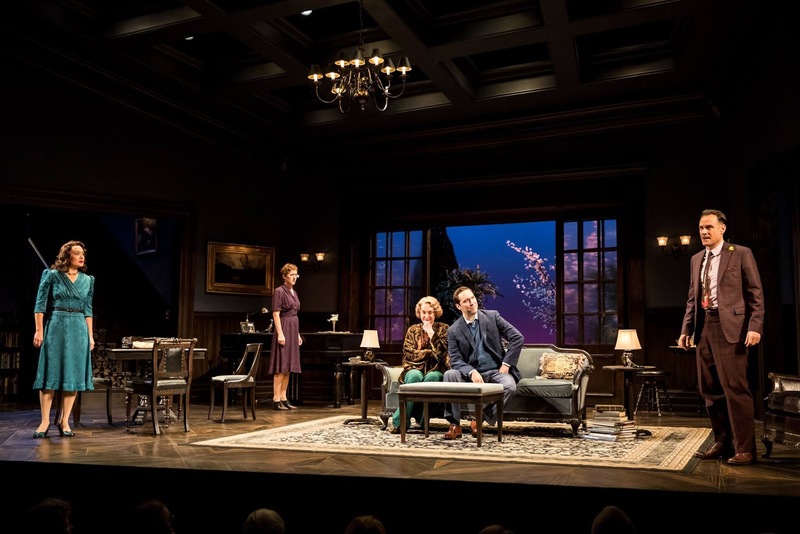 The play is so well-written with such rich layers, it's surprising that this is the first time Lillian Hellman's work has been seen on a Guthrie stage. And to be honest, I had never heard of her before seeing Prime Productions Little Wars earlier this year which, despite being factually inaccurate in some respects, was a fascinating imaginary meeting of Lillian and her contemporaries. I'm thrilled to find out her work is even better than her fictionalized character in that play. This dreamy cast, a mix of familiar faces and new, brings this family to vivid life before us. The highlight for me is Guthrie newbie Elijah Alexander, so lovely as Kurt, beautifully portraying the war-torn soldier's wounds as well as his strength. He's a hero to believe in. He's well-matched in Sarah Agnew's Sara, and the two convey a strong, loving, devoted marriage. 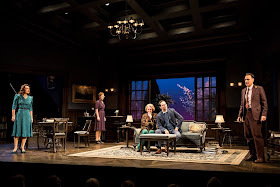 Hugh Kennedy returns to the Guthrie stage for the first time in four years and is wonderful, as always, as the restless David. A divine Caitlin O'Connell reigns as the family matriarch Fanny, and the children could not be more adorably precocious, speaking in multiple languages (I love a play that allows me to dust off my 20-year-old German minor) and accented English (Huxley Westemeier and Kate Regan the night I saw it, alternating with Hal Weilangruber and Carley Clover, plus Silas Sellnow who is no child but believably plays the earnest teen Joshua). James Detmar and Leontyne Mbele-Mbong bring personality to their roles as family servants, Kate Guentzel is believable and sympathetic as the unhappy Marthe, and Jonathan Walker is deliciously evil as Teck (you can tell he's the bad guy by his smarmy thin mustache). 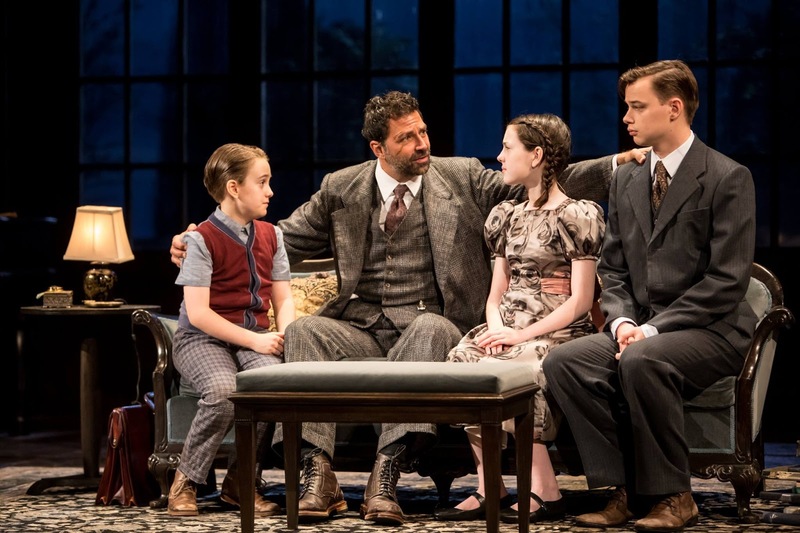 The stage has been converted into the living room of a lovely and stately home, complete with dark woodwork, elegant furniture, art on the walls, grand staircase, the hint of a library offstage, and large windows looking out onto the beautifully lit patio. As the story begins and the family enters, their posh and sophisticated clothing points to their obvious wealth. Into this lush environment come Sara and her family in plain brown traveling clothes with battered luggage, looking every bit the fishes out of water they clearly are. As the story moves on their clothing lightens up, as do their spirits, but the devastation they left behind is never far away, with sound and lighting cues tending toward the ominous as the drama continues. The overall design effect is gorgeous and aids in the storytelling (scenic design by Neil Patel, costume design by Raquel Barreto, lighting design by Alexander V. Nichols, sound design by Paul James Prendergast). 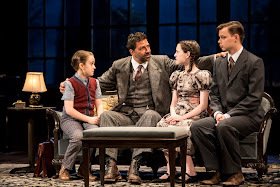 Well-written, fantastically acted, gorgeously designed, timely and relevant, Watch on the Rhine is one not to be missed (continuing through November 5). And be sure to check out the online playguide for some great background information and commentary.